Billy Riley is a classic figure from Sun’s golden age. 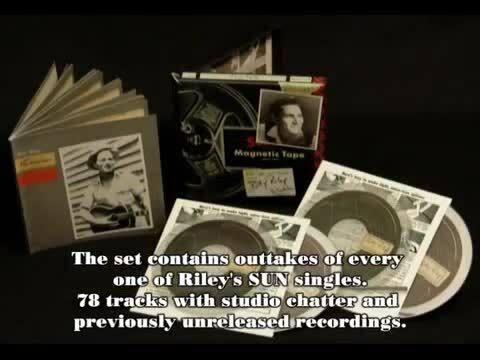 The set contains outtakes of every one of Riley's Sun singles, 78 tracks with studio chatter and previously unreleased recordings. Includes a lavishly illustrated booklet with previously unpublished photos, revised and expanded Sun discography and track-by-track commentaries. A fascinating behind-the-scenes look at recording in the SUN studio during the 1950s. The most complete and detailed look at Billy Riley's Sun career is now available only on Bear Family Records. Billy Riley is one of the unsung heroes of rockabilly. To many collectors, Riley's six Sun singles, issued between 1956 and 1959, guarantee him charter membership in rockabilly heaven. Forget the fact that Riley never had a national hit record. Songs like ''Red Hot'' and ''Flying Saucer Rock And Roll'' enshrine Riley as one of the founding fathers of rock and roll. That assessment is shared by record collectors, historians and Bob Dylan, who paid public tribute to Billy Riley and performed with him in 1992. This unprecedented boxed set brings together virtually every Billy Riley outtake of the 12 sides originally released by the SUN label in the 1950s. It offers the deepest look yet at Billy Riley's recording activity in the historic Memphis studio. Taken together, this set and Bear Family's 2-CD release of ''Classic Billy Riley'' offer the most complete look at Billy Riley at Sun Records ever to be released. This boxed set also includes a lavishly illustrated booklet featuring never-before seen photos of Riley at work in the studio and on tour with his backup group, the Little Green Men. It also includes a revised and expanded Sun discography, detailed track-by-track commentaries, and new interview material by Sun historian Hank Davis. Its 78 tracks include revealing studio chatter and offer a deep, behind-the- scenes look at life in the Sun studio. This is a set that no fan of Billy Riley or vintage Sun Records can be without. BILLY RILEY - Billy Riley only had six records issued under his own name on Sun Records. Sparse as his output may haven been, in rockabilly annals he remains a titan. His recordings of "Flyin' Saucer Rock And Roll" and "Red Hot" are by themselves sufficient to ensure his immortality. The other recordings - both issued and unissued - are evidence of a man with catholic taste and talents versatile enough to match them. Riley a product of Irish and Cherokee ancestry, born on October 5, 1933 in Pocohontas, Arkansas although the family moved often throughout the rural Mid-South. "Back when I was a kid growing up, we lived on a plantation with mostly black people on it. Every Saturday and every Sunday you could usually find a little group of dudes under the trees playing blues. A white guy, Tommy Hamblin, who came from a family of string musicians, taught me how to play three or four chords on the guitar. We started playing with the black musicians, going the blues with them. He and I man, we were black as the rest of' em". Billy Riley had bought a Sears-Roebuck Silvertone guitar at the age of nine from his girlfriend. "She had lost interest in the instrument after it had been sprayed by the termite control people. So I bought it off her, refinished it and learned how to play it". By that time he had already mastered the harmonica, an instrument that his father had taught him. The family grew up in what can only described as abject poverty. "We lived in a tent. A big ol' Army tent. My dad put a floor in it and built walls around it. Then he built two log cabin rooms adjoining - kitchen and dining room". Billy Riley dropped out of school at age 10 and started working to help support the family. In common with every other family in the vicinity, the Riley's owned neither records nor a phonograph. Electricity was uncommon in rural areas at that time but battery radios were available and very popular. Riley fondly recalls listening to and being influenced by Hank Williams and Lefty Frizzell via the radio in the late 1940s. However, he heard no blues on the radio as the advent of black radio programming was still a few years distant. One of the seasonal highlights for the Rileys and neighboring families was the traveling tent shows. The cost was 25c. "We wouldn't see them if they were too far away", Riley recalled, "cause we had no car. About the only way we could get to any place was to walk or find a ride". Halfway through his thirteenth year, Billy Riley's family left the plantation in Arkansas and headed southeast to Tupelo, Mississippi bringing their tent with them. Riley's father was working as a painter but after a year with work at a premium the family pulled up roots again and headed back to Arkansas - this time to Osceola. While in Tupelo though, Riley had made his first public appearance, performing live on radio station WELO. In 1948 Billy Riley tried to enlist in the armed services. Only 15 years of age, he was rejected. By 1949 the family had moved back to Pocohontas although his sister stayed in Osceola. Riley tried again to enlist and with his sister signing the necessary papers attesting that he was 18 (Riley had no birth certificate), he became an employee of Uncle Sam. For Riley, the Army was just a way out of grinding rural poverty although he eventually saw some benefits: "While I was in the service I got more interested in music because I won some talent shows at the service club". Playing in these talent shows, singing hard country music along the lines defined by Hank Williams, Lefty Frizzell and Hank Thompson, Riley first performed in a full band context. He was even offered a position in Special Services but surprisingly turned it down due to stage fright. During his hitch in the service, he made his first private recordings including the Hank Williams weeper "My Son Calls Another Man Daddy". It is unclear exactly how long Billy Riley spent in the service. He recalled to Bill Millar that he returned briefly to civilian life and then re-enlisted for three years. In any event, Riley probably found himself back in civilian duds around 1953 or 1954. Music was now much more than a hobby and upon discharge he joined a couple of country bands that worked in and around Jonesboro, Arkansas - C.D. Tennyson and the Happy Valley Boys and the KBTM Ranch Boys. While supporting himself and his first wife with a day job in a shoe factory, Billy Riley could be heard regularly on three local radio stations - KBMT and KNEX in Jonesboro and KRLA in Paragould. Both the bands with whom Riley worked taped their shows on Sunday for broadcast during the week. At the same time, Riley together with the bassist and the bassist's wife from the KBTM Ranch Boys rose early in the morning to perform live on a gospel show. Not making a lot of money in the shoe factory or with his music, Riley was talked into moving to Memphis by his brother-in-law. Together they opened a restaurant and Riley briefly forsook music. After the restaurant failed, Billy Riley worked as a meat cutter and than as a truck driver for Industrial Coverall. "That's when my mind was on music. When I wrecked that truck I was singing 'Trouble Bound'. I worked there until I wrecked two trucks". Riley joined Slim Wallace's Dixie Ramblers. Wallace was a local truck driver who played bass in a band which also featured Jack Clement, then attending Memphis State University. Wallace and Clement got the notion to start a record label, Fernwood Records, named after the street upon which Wallace lived. The studio was a primitive affair, literally situated in his garage. The Dixie Ramblers consisted of Roland "Slim" Wallace, Jack Clement, Billy Riley, Wayne McGinnis and Ramon Maupin, they played straight ahead hard country music, mostly on the weekends. Its interesting to note Riley's first playing experience - at least on guitar - was with black blues musicians on the plantation where he lived with his parents. yet, up to this point in his semi-pro career, he had only publicly played country music. As with many other future rockabillies he never realized that he had an option. He was white, therefore if he wanted to play music, he played country. That was simply what white Southern musicians did. Riley explained: "After hearing Elvis and seeing what was happening, a lot of us guys got away from the country stuff. We wanted to get with what was happening. When it was new it was something completely different from what anybody had ever done. It was something that fit me because it sounded black. It was still country but it had that black feel and that was what I wanted. It was something I was brought up on". After Billy Riley had played a couple of months with the Dixie Ramblers, Jack Clement had the idea that the first release on Fernwood should be by Billy Riley. Surprisingly in view of Riley's growing infatuation with the new music, the Dizie Ramblers first attempted a country song, a Riley original entitled "Think Before You Go". At that point the group consisted of Riley, Wallace, Bob Deckelman on steel guitar and a fiddle player. They recorded two songs, "Trouble Bound" and "Think Before You Go". in a primitive studio Clement had built in Wallace's garage. Clement took the masters to Sam Phillips, who responded to the eerie, bluesy intensity of "Trouble Bound" and offered a job to Clement and a contract to Riley. Sam Phillips counseled against releasing the countrified "Think Before You Go", so Riley concocted a rockabilly novelty, "Rock With Me Baby", that he recorded at the WMPS studio in Memphis. Purchasing the masters from Fernwood, Sam Phillips issued Riley's debut single in May 1956. With a record on the market, Riley needed to put a band together, Clement was too busy at Sun to be playing clubs and Bernero had always been temporary. That left only guitarist Roland Janes. Riley and Janes had met a teenage drummer, J.M. Van Eaton, when Van Eaton had been down at Sun with another group. He was quickly drafted into the fold, as was upright bassist Marvin Pepper. By the end of 1956, Riley's group had been co-opted as the house band at Sun Records. After a four year involvement with Sun, Riley decided to quit again, Jack Clement and Bill Justis had been dismissed in early 1959. Both started their own labels. Riley did some work for Justis, cutting an instrumental record pseudonymously for Jaro/Top Rank under the name "Spitfires". By this point he had reunited with Roland Janes and they held down a steady gig at the Starlight Club in Memphis. It was there that they came up with the idea for Rita Records settled in the old Sun studio. One of the first moves was to bring Harold Dorman to the label. Dorman had been languished around town since 1856, trying to hustle a deal for himself and his writing partner Wiley Gann. Riley and Janes took Dorman and Gann to the Hi studio, paid Jack Clement to handle the board and emerged with "Mountain Of Love" which became a nationwide hit in 1960. Rita Records was a short-lived venture and Riley's involvement in it was even shorter. Commercially, none of Riley's records had much impact. Sam Phillips has more than once lamented this fact, stating that he does not understanding why Riley never broke through. To Riley though, its simple: "Jerry Lee and Sam got too this what happened to me". Through the 1960s and 1970s, Riley persevered in the music business. He recorded under his own name and a host of pseudonyms including the Megatrons, the Rockin' Stockings and Sandy & the Sandstones. The list of labels for whom he recorded is even longer. He even achieved a small breakthrough on the Entrance label in 1972 with the Chips Moman produced "I Got A Thing About You Baby" that later Elvis covered. Immediately preceding his deal with Entrance, Riley had returned to the re-born Sun label owned by Shelby Singleton in Nashville, launching it in fine style with "Kay". Both "Kay" and "Red Hot" were - in their way - definitive performances but the gulf between them highlighted Riley's real problem: he lacked an identifiable style. With all the talent in the world, Riley would not stick in one groove long enough to reap the rewards. His versatility was his greatest asset and his greatest drawback. Since 1983 Billy Riley has refused to gig, recorded little and released nothing. If the right offer under the right conditions came along he would probably give it one last go-round. In the meantime, he supports himself as a contractor, rarely dwelling upon his impressive - if less than successful - past. All of us involved with this project revere Billy Riley for his music. When Joyce met Billy on April 11, 1975, she knew nothing about Billy's music or Sun Records. She fell in love with a hard-working man who was raising two daughters, ages 3 and 6, by himself. Only later did Joyce discover the music featured here. Joyce and Billy were married just about two weeks after they met, on April 26, 1975. Joyce was still with Billy 34 years later when he died of colon cancer on August 2, 2009. The final years of Billy's life were a medical and,consequently, a financial nightmare. Orginal Sun Recordings licensed from Sun Entertainment, Inc.